Rutaparna Panda is an Indian shuttler who represented India in the 2017 BWF World Junior Championships. She also won the Junior National Championships. She is currently training in the Gopichand Academy. In an exclusive interview with Sportskeeda, Panda talks about her entire badminton career. What prompted you to choose Badminton as your career? Who supported you during your ups and downs? Panda: When I was young my father used to play outdoor badminton in our colony. I started going with him, watched him play with his friends sitting outdoors in the cold weather till 12 at night. This was my first experience towards Badminton. When my father saw my interest in Badminton, he started to teach me how to play the game. Initially, me and my father started playing Badminton on the rooftop. After a few months, he realized that playing Badminton requires a wooden indoor court. Then we daily travelled to Bhubaneshwar from Cuttack on his bike in crowded traffic for my better practice. The court was almost 30 km away from our home. It became a daily routine. We had to reach there by 6 o'clock in the morning, which was quite difficult during rainy and winter season. It was a tough journey for us for almost two years. In the year 2010, I participated in the State Open Badminton Championship and stood second (runner-up) in the U-13 singles category and was selected for the Nationals. At the age of 12, I became the State U-13, U-15, U-17 and U-19 champion in the year 2011. Thereafter I played the game professionally and took up badminton as my career choice. I have come across a lot of ups and downs in my career. My parents and coaches have always supported me during my ups and downs. You are currently associated with Gopichand Academy in Hyderabad. What has been your experience out there? Panda: It's like a dream come true. I was dreaming for it since many years. But there was no chance of getting there. Initially, I was playing singles. I could hardly get to the 7th position (rank) in the All India U-17 girls singles category. So there was no hope of getting a chance in the academy without professional coaching and doing better in Nationals. But still, I was lucky enough. When I was playing women doubles in the 81st Senior Nationals 2017 at Patna, Bihar partnering with my younger sister Swetaparna who was only 12 years old then, I came to the notice of Mr. Arun Vishnu sir who is the chief doubles coach of Gopichand Badminton Academy. He and Mr. Siyadath sir called me and told me to join the academy in the doubles batch for one month trial. It was a dilemma for me at that point of time, because I was not willing to quit singles for doubles. But my father advised me to join the academy, as it was a matter of only one month. But after one month Mr. Arun Vishnu bhaiya told me to continue for further two/three months and prepared us for forthcoming three All India Ranking Tournaments. I performed well in those three tournaments, got the three titles in U-19 girls doubles and one title and two runner-ups in mixed doubles. Thereafter, all the academy coaches were happy with my performance and I got an admission in the academy. I think I am very lucky to get into the best badminton academy in India. Gopichand sir is very approachable and is always guiding us to the right path. Our coaches, physios and support staffs at the academy are very professional and also very supportive towards us. All in all, we live in a friendly atmosphere here in Hyderabad. You and Mithula are now being considered as one of the most promising doubles pair for India. How do you look at this comment? Panda: We are taking this comment very positively. We are working hard and looking forward to winning more medals for our country. Your sister Swetaparna is also a badminton player. What kind of relations have you shared in badminton career with her? Panda: She is a very talented badminton player. She was my U-19 and senior doubles partner when I was playing in Odisha. We played together in the East Zone-2016 in Darbhanga, Bihar, 41st Junior Nationals 2016 in Udupi, Karnataka and in the 81st Senior Nationals 2016-17 in Patna, Bihar. It is because of her contribution that we won in the East Zone U-19 girls doubles title when I was suffering from severe fever. Her net play was outstanding and she always gave me confidence in the game although she was only 12 years of age then. I always have had good relation with her on and off the court. I am really blessed to have such a talented and loving sister. I hope she will be an asset of Indian badminton in future. You won the Gold Medal in the National Jr. Championship. What was the feeling when you won the title? 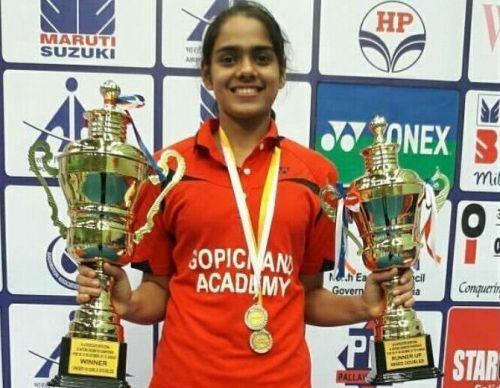 Panda: It was a wonderful feeling as it was my last year in junior and I just got an admission in Gopichand Academy. I was very motivated and prepared really hard to be a Junior National champion. During Nationals, while playing I had injured my right ankle. But my coaches and physios gave me confidence and treated me properly so that I could be able to win the title. You represented India for the first time in the Badminton Asia Junior Championships 2017. How would you like to analyse your performance out there? Panda: Badminton Asia Junior Championship 2017 was my first international tournament. So it was quite an exciting experience for me. I played both in team championship and individual events. I got an opportunity to watch and learn from many quality matches. During the tournament, I realized that I have to work even harder to catch up with Chinese and Korean players. You aim to bag gold medal for India in the 2024 Tokyo Olympics. What modifications have you made in your training in order to achieve your goal? Panda: My coaches have made some modifications in my schedule. Previously it was just two sessions a day. Now it has been extended to three seasons daily. My coaches are working to rectify my small mistakes. I am giving extra attention to my diet and rest. I am working with strength and conditioning training to improve my strength and fitness. You have been an inspiration especially for people of Odisha. What piece of advice would you like to give to the budding shuttlers who wish to represent the country? Panda: I would like to say to the budding shuttlers to just dream big. It is sheer hard work, patience, determination and dedication which will make you able to achieve your goal. There is no shortcut to success and we have to be positive in our bad times and cherish the good times in our career. Do you think Rutaparna Panda will win an Olympic gold medal for India in the future? Tell us in the comments below!